But enough about Tyrion committing patricide on the toilet - Bronn is what's really important about this scene, right? 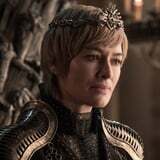 Qyburn tells him that although the sellsword might still be frosty towards the Lannisters after having his castle and his wife taken away, Cersei is willing to pay him with with four chests of gold in return for him serving her brothers with "poetic justice." He's reluctant, but Qyburn seems to sway his mind by noting how handsomely Cersei rewards those of whom do her big favors. "What would she do for the man who rids her of her treasonous brothers?" he muses. So, will Bronn kill Jaime and Tyrion?